Dr. Jamuna Pai's Blush: Hello, botoxed bride ! Botox brides are trending and how. They are a new breed of multitasking individuals – qualified, mature, career-oriented, experienced, and, on the other side of 30. 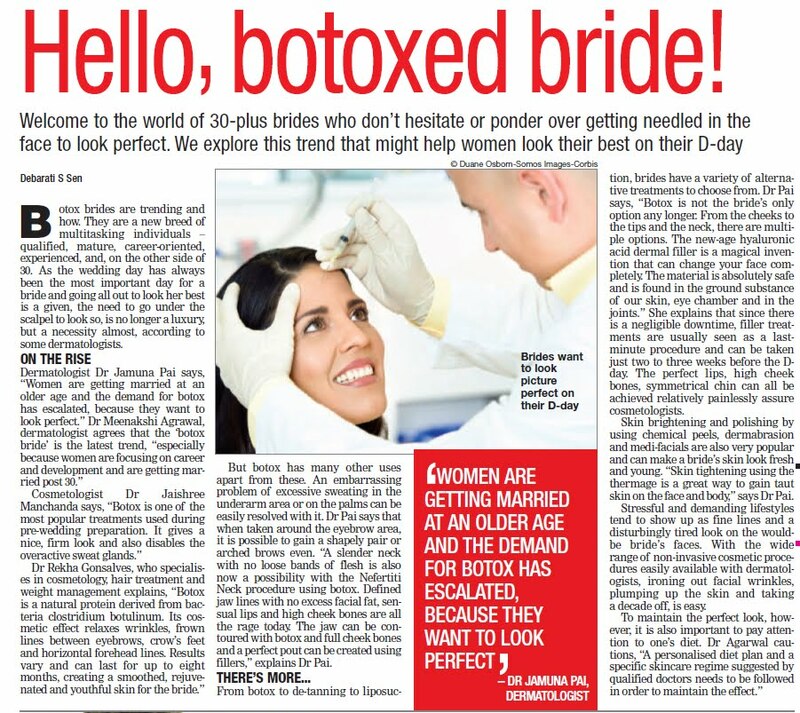 As the wedding day has always been the most important day for a bride and going all out to look her best is a given, the need to go under the scalpel to look so, is no longer a luxury, but a necessity almost, according to some dermatologists. 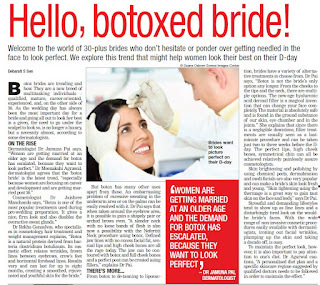 Dermatologist Dr Jamuna Pai says, “Women are getting married at an older age and the demand for botox has escalated, because they want to look perfect.” Dr Meenakshi Agrawal, dermatologist agrees that the ‘botox bride’ is the latest trend, “especially because women are focusing on career and development and are getting married post 30.” Cosmetologist Dr Jaishree Manchanda says, “Botox is one of the most popular treatments used during pre-wedding preparation. It gives a nice, firm look and also disables the overactive sweat glands.” Dr Rekha Gonsalves, who specializes in cosmetology, hair treatment and weight management explains, “Botox is a natural protein derived from bacteria clostridium botulinum. Its cosmetic effect relaxes wrinkles, frown lines between eyebrows, crow’s feet and horizontal forehead lines. Results vary and can last for up to eight months, creating a smoothed, rejuvenated and youthful skin for the bride.” But botox has many other uses apart from these. An embarrassing problem of excessive sweating in the underarm area or on the palms can be easily resolved with it. Dr Pai says that when taken around the eyebrow area, it is possible to gain a shapely pair or arched brows even. “A slender neck with no loose bands of flesh is also now a possibility with the Nefertiti Neck procedure using botox. Defined jaw lines with no excess facial fat, sensual lips and high cheek bones are all the rage today. The jaw can be contoured with botox and full cheek bones and a perfect pout can be created using fillers,” explains Dr Pai. THERE’S MORE...From botox to de-tanning to liposuction, brides have a variety of alternative treatments to choose from. Dr Pai says, “Botox is not the bride’s only option any longer. From the cheeks to the tips and the neck, there are multiple options. The new-age hyaluronic acid dermal filler is a magical invention that can change your face completely. The material is absolutely safe and is found in the ground substance of our skin, eye chamber and in the joints.” She explains that since there is a negligible downtime, filler treatments are usually seen as a last minute procedure and can be taken just two to three weeks before the Dday. The perfect lips, high cheek bones, symmetrical chin can all be achieved relatively painlessly assure cosmetologists. Skin brightening and polishing by using chemical peels, dermabrasion and medi-facials are also very popular and can make a bride’s skin look fresh and young. “Skin tightening using the thermage is a great way to gain taut skin on the face and body,” says Dr Pai.